The following publications are free for you to download, enlarge, and distribute. Please contact us at DREAM@ahead.org if you have any questions, need help with downloading a file, or want to suggest topics for or help with future DREAM publications! Our two-page brochure, "DREAM: An Online Community for College Students with Disabilities"
Our newsletter, This Week's News in Disability and Higher Education, which you can receive in your mailbox each week by joining our listserv. 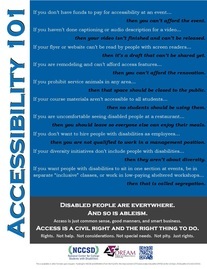 The poster, "Accessibility 101," which lists situations in which people with disabilities do not have equal access. The list concludes: "Access is a Civil Right and the Right Thing to Do." Beneath the list are the statements: "Disabled people are everywhere and so is ableism. Access is a civil right and the right thing to do." The poster, "Be An Ally," which gives 10 tips for being a good ally to people with disabilities, such as "Change your language" and "Put your new knowledge to work." The word "ally" in the poster title includes the international symbol for access (a blue person leaning forward in their wheelchair) for the letter A, the three vertical dots that make the braille letter L, and the ASL sign for the letter Y. 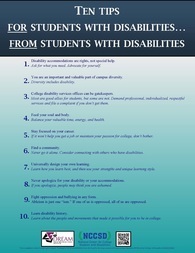 Our "Ten Tips" poster for college students with disabilities from college students with disabilities. The list makes if-then statements about access, such as "If your diversity initiatives don't include people with disabilities... then they aren't about diversity." Our get-out-the-vote poster featuring a quote from pioneering disability rights activist Ed Robert, who attended UC Berkeley: "If we're going to turn this thing around, we're gonna have to get our people out to vote!" We also recommend the student pages of The NCCSD Clearinghouse and Resource Library. Look for the links for "Future College Students" and "Current College Students."